1. Fluid balance. The lymphatic system takes up excess tissue fluid and returns it to the bloodstream. Recall that lymphatic capillaries lie very near blood capillaries, and they serve as an auxiliary way to take up fluid that has exited the blood capillaries (see Fig. 11.7). 2. Fat absorption. The lymphatic system absorbs fats from the digestive tract and transports them to the bloodstream. Special lymphatic capillaries called lacteals are located in the intestinal villi. This function ensures the absorption of dietary lipids as well as lipid-soluble vitamins. 3. Defense. The lymphatic system helps defend the body against disease. This function is carried out by the white blood cells present in lymphatic vessels and lymphatic organs. Lymphatic vessels form a one-way system that begins with lymphatic capillaries. Most regions of the body are richly supplied with lymphatic capillaries, tiny, closed-ended vessels whose walls consist of simple squamous epithelium (Fig. 13.1). 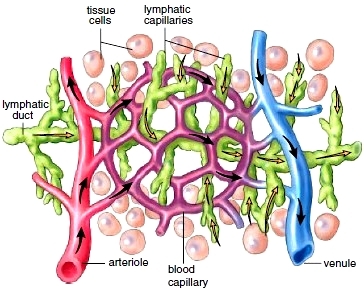 Lymphatic capillaries take up excess tissue fluid. Tissue fluid is mostly water, but it also contains solutes (e.g., nutrients, electrolytes, and oxygen) derived from plasma and cellular products (i.e., hormones, enzymes, and wastes) secreted by cells. These all become lymph, the fluid inside lymphatic vessels. Figure 13.1 The lymphatic system. Lymphatic vessels drain excess fluid from the tissues and return it to the cardiovascular system. The enlargement shows that lymphatic vessels, like cardiovascular veins, have valves to prevent backward flow. The tonsils, spleen, thymus gland, and red bone marrow are among those lymphatic organs that assist immunity. Figure 11.7 Lymphatic capillaries. Lymphatic capillaries lie near blood capillaries. The black arrows show the flow of blood. The yellow arrows show that lymph is formed when lymphatic capillaries take up excess tissue fluid. 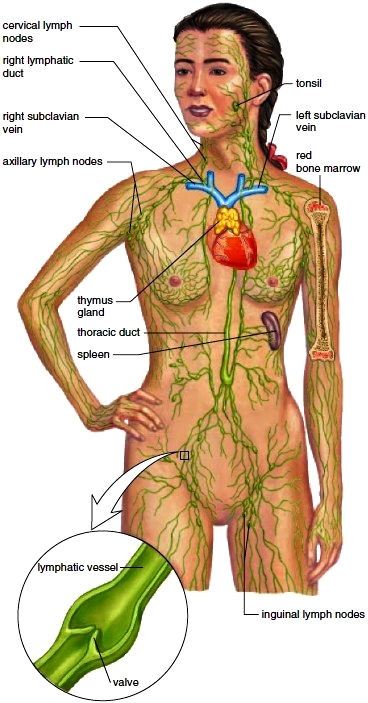 The lymphatic capillaries join to form lymphatic vessels that merge before entering one of two ducts: the thoracic duct or the right lymphatic duct. The larger, thoracic duct returns lymph collected from the body below the thorax and the left arm and left side of the head and neck into the left subclavian vein. The right lymphatic duct returns lymph from the right arm and right side of the head and neck into the right subclavian vein. The construction of the larger lymphatic vessels is similar to that of cardiovascular veins, including the presence of valves. The movement of lymph within lymphatic capillaries is largely dependent upon skeletal muscle contraction. Lymph forced through lymphatic vessels as a result of muscular compression is prevented from flowing backward by oneway valves. Edema is localized swelling caused by the accumulation of tissue fluid that has not been collected by the lymphatic system. This can happen if too much tissue fluid is made and/or if not enough of it is drained away. Edema can lead to tissue damage and eventual death, illustrating the importance of the function of the lymphatic system. The fat absorption and defense functions of the lymphatic system are equally important. Unfortunately, cancer cells sometimes enter lymphatic vessels and move undetected to other regions of the body where they produce secondary tumors. In this way, the lymphatic system sometimes assists metastasis, the spread of cancer far from its place of origin.